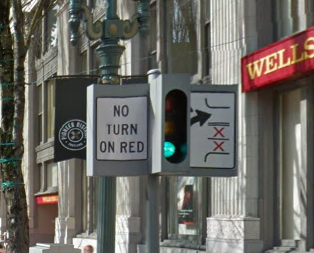 The sign says NO TURN ON RED. It very clearly indicates what lanes you are legally allowed to turn into. Naturally, the car in front of me turns, on red, into a lane in which it is not allowed. He joins a veritable parade of cars illegally blocking the transit lanes, for what purpose I cannot discern. Further up the street, a car honks at a bus pulling away from the bus stop, even though the car is breaking the law by being in a transit lane. Behind me, a train has to slow to a crawl. The trains take a full block to come to a stop, so the operator has to hit the brakes early to avoid crushing all the cars parked on the tracks. Drivers think the law is very important, which is why they always obey it.